This is a Sorbus only recently given a vernacular name but with some very specific characteristics which help to identify it. Sorbus porrigentiformis is a member of the Aria aggregate and so has crimson red fruits with lenticels (white scabs) towards the base of the fruit. The smallish fruits are also said to be subglobose which means they are flattened with a polar diameter shorter than the equatorial. The fruits tend to point upwards instead of hanging down. The leaves usually have 8 to 10 pairs of veins (7 to 11) and tend to point upwards at an angle. The leaves are also strongly biserrate which means there are two distinct teeth between each vein. The upward pointing leaf habit gives a cluster of leaves at the end of a twig or branch a very distinctive look. The leaves are white tomentose underneath (white furry layer) like many of the aria aggregate. 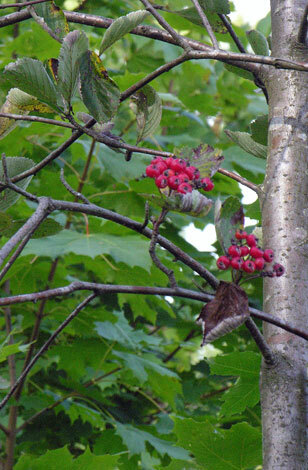 There are two forms of Sorbus porrigentiformis according to Proctor and Greenhoff (1992) a twiggy shrub like tree (common one) with broad crimson fruits and a less common one found in South wales with larger scarlet fruits. (Just when I thought the Sorbus genus was beginning to make sense) Nevertheless S. porrigentiformis is one of the few British endemic species and is found in Wales and England only. The Latin word Porrigentis means to "stretch out" or "extend" in English which almost definitely refers to the way the leaves grow (formis). 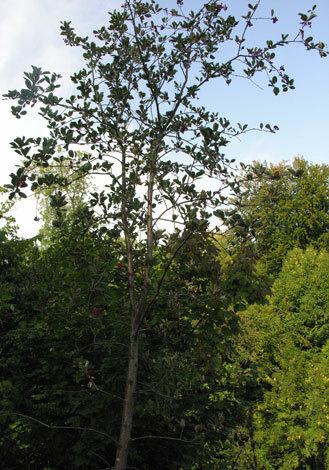 The vernacular name for Sorbus porrigentiformis perhaps should have been Erect-leaved Whitebeam.